Located in the southwestern corner of Brooklyn, the neighborhood of Red Hook boasts a long and tumultuous history. It was for one, the place where Al Capone started his mobster career. The neighborhood is surrounded by water on three sides and by the Gowanus Parkway as well as the Battery Tunnel on the fourth. 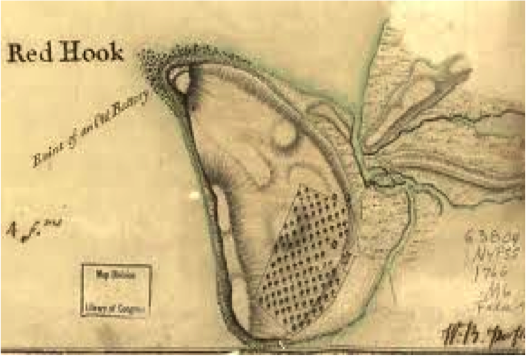 Originally called Red Hook because of its rusted colored soil and the shape of land that protrudes from the coast of Brooklyn. The earliest notable property owners in Red Hook were brothers Nicholas and Matthias Van Dye. These two were farmers that constructed two mills on their property, which were powered by the creeks. One was a ginger mill, while the other was a flourmill. Large-scale projects began to take place in Red Hook in the 1830s because of its close location to the busy docks of Manhattan and the opening of the Erie Canal in 1825. The Red Hook Building Company which was led by local Brooklyn developer Colonel Daniel Richards, acquired a large piece of land form the Van Dyke brothers and in 1838 proposed building hundreds of residences that would be serviced by a ferry connecting Red Hook to Manhattan but the project fell apart. In 1840, Richards obtained approval form the New York State Legislature to build a large shipping terminal on Buttermilk Channel opposite Governor’s Island. It was completed in 1848 and provided large ships the ability to sail through the Port of New York. In 1843, Irish immigrant William Beard purchased a large amount of waterfront in Red Hook, just south of the Atlantic Basin and began filling it with farmland. By the end of the 1850s, he had acquired over one million square feet of land and began constructing the Erie Basin at the southwest tip of Red Hook. Here, in 1864, the Erie Basin became popular for ship repair and grain storage. After completion, Beard sold a portion of land to the Anglo-American Dock Company, which proceeded to constructing the area’s first graving doc, facilitating large-scale ship repair. During the Civil War, the Erie Basin was the center for ship repair in New York. After the Civil War, thousands of immigrant workers poured into the neighborhood looking for work in the industrial port. The 1860s through the 1890s were the busiest years of Red Hook’s industrial development. Before becoming a part of New York City in 1898, Brooklyn was the fourth largest city in the country providing thousands of jobs in waterfront factories and storehouses. Red Hook itself had transformed from a farmland to an industrial port center. Immigrants from Ireland, Germany and Italy filled South Brooklyn near the docks and piers. The twentieth century proved to be a difficult one for Red Hook. 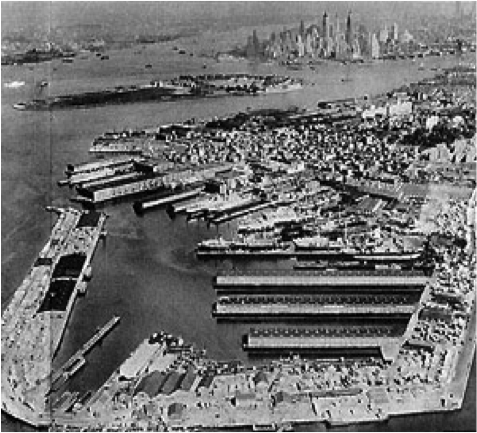 The major wave of industrial building had receded noticeably and the loss of grain terminals was devastating for Red Hook. As time moved on, the population of Red Hook started to decline. Even the New York Dock Company had pulled out of Red Hook, abandoning the traditional storehouses and piers along its waterfront for the Port of Newark. The land was then left unoccupied and undesirable until the city took control of the abandoned properties. During the 1950’s, the City of New York demolished Civil War era warehouses on the Atlantic Basin and the large pier built by Beard at the mouth of the Erie Basin was split in two to provide better access between the waterfront and the Basin. 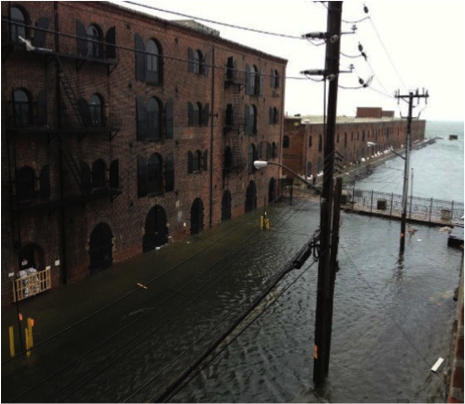 Today, Red Hook begins a restoration project after a majority of its area was destroyed due to Hurricane Sandy. Businesses were flooded; the Red Hook library suffered over $100,000 in damages. The area has just started to recover with businesses finally being able to open up again after renovating entire infrastructures in some cases. Red Hook’s biggest attraction is the huge Ikea as well as the Fairway, which is an enormous 33,000 square foot supermarket. Red Hook has a rich waterfront history that can easily be seen even to this day.